Before Boston University’s women’s lacrosse extended its winning streak to four games with a 9-6 victory against Bucknell University, the team’s six-member senior class took to Nickerson Field in recognition of its 36-32 record with the program, which includes three appearances in the Patriot League Tournament semifinals. After a stuttering start to the season, the Terriers ended Saturday afternoon with its first winning record of the 2018 season and move to .500 in the conference. With a roster that includes 10 freshmen, a bit of a learning curve can be expected. However, the win over the Bison (3-10, 1-5 Patriot League) suggested that the seniors will be leaving their team in good hands, as eight of the team’s nine goals came from underclassmen. While BU head coach Liz Robertshaw noted a need for greater offense, she also expressed pride for how the young team has developed through the season. Sophomore midfielder Lexi Lewis opened the scoring 1:22 into the first half, her 12th goal of the season. The Bison evened up the score for the first and only time of the game soon after, and the Terriers responded with three goals of their own, with freshman attack Ava Barry contributing a goal and an assist. Barry ended the game with two goals, an assist, three ground balls and a caused turnover. Freshman midfielder Ryann Gaffney also continued her three-game, multi-goal streak with two goals. 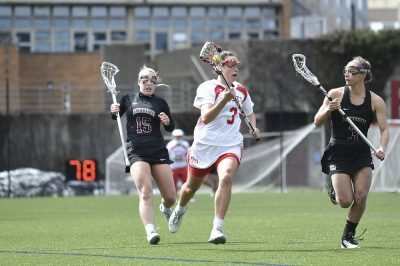 After an injury kept BU’s leading goal-scorer senior attack and co-captain Avery Donahoe on the sidelines, its leading point-producer sophomore attack Kailey Conry adapted to taking shots of her own that converted into a two-goal afternoon. After a five-goal, 14-assist series against Harvard University and American University, Conry earned her first Patriot League Attacker of the Week recognition last Monday. In such a low-scoring game for the offense, Robertshaw also had praise for the Terriers’ defense that was spearheaded by the seniors. After earning her spot as BU’s starter, senior goalkeeper Christine Laible has built up eight double-digit save efforts this season, which included 10 saves Saturday afternoon. The Terriers cut their 13.12 average goals allowed per game by more than a half, and limited Bucknell’s offense that averages 7.62 goals per game. BU also limited the Bison to 24-for-32 on their clears. Before Bucknell freshman attack Eve Calabria closed the scoring with a free-position goal with 1:44 remaining in regulation, BU hadn’t allowed a Bison goal in over 19 minutes. Senior midfielder and defender Sarah Andersen, senior defender Maddie Curley and junior defender Tonianne Magnelli helped hold down the fort, collecting two ground balls apiece. Additionally, of Bucknell’s 22 turnovers, four were caused by senior defender and co-captain Maria Guerra. Guerra also collected four ground balls, improving on her average of 2.77 ground balls per game, which is good for third in the Patriot League. The Philadelphia native said following the game she could hardly believe that she was already playing on Senior Day.